On Saturday, October 11, St. George’s University hosted the 2nd Annual Bioethics Forum of the Bioethics Society of the English-Speaking Caribbean (BSEC). The primary objective of this forum was to communicate bioethical concerns with regard to patient care in the Caribbean and advocate for the development of ethical policies to improve the current standards. Dr. Derrick Aarons, BSEC President and founder, welcomed an audience of SGU faculty, medical students, physicians, nurses and paramedical staff representing local communities and the region. As the first speaker, Dr. Cheryl Macpherson, Professor and Chair, Bioethics Department and Vice President of BSEC, addressed concerns about untreated pain and pain management and its social and economic implications. Having worked with the former Minister of Health, the Honorable Ann David Antoine, Dr. Macpherson drew upon her experience as Chair of the Steering Committee to Develop Palliative and Hospice Care (CDPHC). Since 2003, the CDPHC has been working to expand patient care to include aspects of palliative and hospice services for the terminally and chronically ill patients in Grenada. On behalf of CDPHC, SGU’s Bioethics Department is developing a grant proposal to support further efforts that foster continuing education in pain relief and palliation in Grenada. This effort translates to work on campus as well, as the Bioethics Department has assisted Dr. Chamarthy Subbarao, Director of SGU Health Services and Planning Committee Chair, in organizing Continuing Medical Education (CME) programs for Caribbean health providers about pain relief. Other speakers included founder Dr. Derrick Aarons who discussed “Ethical Issues in Health Care for Patients with HIV.” Dr. Aarons, a Consultant Bioethicist and Member, International Advisory Board for Bioethics, PAHO, was recently awarded a Consultancy Contract to develop a Regional Model Code of Practice for Medical Practitioners and Medical Associations across the Caribbean in response to HIV and AIDS from The Pan-Caribbean Partnership against HIV and AIDS. Merle Mendonca, a Human Rights Advocate from Guyana, offered insight into an individual’s right with regard to medical science and health care delivery. Dr. James Appleyard, Professor of Pediatrics, and Past President of the World Medical Association spoke of “Ethical Issues in Medical Research on Children.” Dr. Donald Simeon, Director of the Caribbean Health Research Council, spoke about other aspects of research ethics relevant to the region. With respect to the many topics covered throughout the Forum, several opportunities for questions and answers and open discussions were made available to the participants. Since its inception in 2006, the BSEC has positioned itself to offer guidance and support through discussions, consultations, publications and workshops that address regional concerns regarding ethics and professionalism. Dr. Derrick Aarons, a successful and respected physician and bioethicist, is credited with its formation and its continued effort to encourage and enhance further development in public and professional arenas. The Society encompasses about 60 members who include physicians, medical educators, and public health specialists from many different Caribbean nations. The Annual BSEC Forum plays a critical role in the continued expansion of the Bioethics Society, as it provides a dynamic arena to communicate the many facets of bioethics and professionalism and its current and future impact on the Caribbean. This year’s event was jointly sponsored by St. George’s University School of Medicine and the Caribbean College of Family Physicians. The 2009 Forum will focus on ethics and the environment and will be hosted in Trinidad. For more information, visit the BSEC online at bioethicscaribe.org. Caribbean artwork was beautifully represented at the 2nd Annual International Caribbean Art Fair in the gallery-packed Chelsea district of New York City on November 6-9th. St. George’s University sponsored a booth which showcased the vibrant and distinctive collections of internationally recognized Grenadian artists Oliver Benoit and Susan Mains, along with the works of the late Canute Caliste from nearby Carriacou. Each artist’s work has been inspired by the innate beauty of Grenada and its surroundings. St. George’s University’s presence at the International Caribbean Art Fair played a vital role in the promotion and recognition of artwork from Grenada. It has long been a mission of the University to promote the many talented artists of Grenada in regions beyond the Caribbean. Dr. Benoit, who is also Assistant Professor at St. George’s University’s School of Arts and Sciences, was pleased with the feedback he received from the many visitors to the event: “There were several people who, having recognized the University’s name, shared stories of their experiences in Grenada.” Dr. Benoit explained that the most surprising revelation was the fact that everyone who visited the SGU booth had never before seen Grenadian art, further emphasizing the need to promote the talent of Island. Dr. Benoit believes that the University’s participation helped forge strong relationships with galleries and institutes in New York as well as other parts of the Caribbean. This relationship will also benefit the new studio art program he is developing at the University. The exciting endeavor will offer community members as well as students the opportunity to develop new skills and discover hidden talents in an environment that provides an outlet for personal artistic expression. Susan Mains, who holds a PhD in education, is one of the art course instructors. Chancellor Charles Modica visited the exhibition and discussed with Dr. Benoit, Susan Mains and Andréa Anderson, a representative for Grenadian artists, his desire to establish Grenada’s first art museum as a permanent arena to share the artwork of Grenada with both visitors and residents. The use of St. George’s University’s Caribbean House is in discussion as a possible host for the site. Armed with museum and gallery experience in New York, Boston and Santa Fe, NM, Andréa Anderson plans to assist in this inspirational project. Canute Caliste was a critical addition to the exhibit as he is one of the most celebrated artists of the Caribbean. His paintings of Caribbean island life feature fishing boats, cricket matches, carnival dances and domestic rows, and usually display a great deal of humor and creative interpretation. Caliste died at age 91 having lived a full and eccentric life as a painter, musician and boat builder. Dr. Oliver Benoit is an abstract painter for 30 years whose works exemplify bold, theoretical statement. Dr. Benoit creates in two mediums: watercolors and encaustic, also known as hot wax painting. Encuastic involves adding colored pigments to heated beeswax and then applying this to a canvas or other material. Educated in the United Kingdom and the United States, Dr. Benoit’s abstract designs are displayed by private collectors throughout the globe. Susan Mains, a self-taught artist for more than 20 years, is a dual citizen of the United States and Grenada and has exhibited with Dr. Benoit previously. Her striking landscapes and dramatic figurative paintings are motivated by conceptual ideas and are sought after and collected internationally. Both Dr. Benoit and Ms. Mains compose works with harmonious colors that create layers of texture and are both visually pleasing and symbolically meaningful in their content. While their styles are contrasting, they share a common underlying emotion which is complimentary when displayed together. On Saturday, October 25th, St. George’s University hosted a symbolic and emotional ceremony to honor the brave soldiers who served and suffered the ultimate price during the Intervention in Grenada in October of 1983. Chancellor Charles R. Modica, and Provost Allen H. Pensick were joined by several influential leaders within the Grenada community and beyond including, Grenada Prime Minister Hon. Tillman Thomas, Lieutenant General Glenn Spears, Deputy to the Admiral of the US Army, US Ambassador to Bridgetown and the Eastern Caribbean, Ambassador Mary Ourisman, and Reverend Tessica Hackshaw, Superintendent of the Grenada Methodist Church. Dr. Pensick welcomed all attendees to the proceeding, extending a special welcome to the family members of the soldiers who fought valiantly during Operation Urgent Fury. Reflecting upon the devastating loss of 19 American servicemen on that dark day, Dr. Modica recognized some of the soldiers who served with their fallen comrades and asked them to stand. “We are at a loss for words,” he said, “but not at a loss of emotions.” He hoped that the ceremony brought to life the University’s commitment to the memories of the soldiers, assuring that their loss was not in vain. The ceremony took place at the Memorial, which was commissioned by the parents of the soldiers and displays the signatures of those fallen. An exact replica of the Memorial was present on the first anniversary of the Invasion. General Spears eloquently expressed the many emotions felt by all attendees as they gathered in both “solemn remembrance and celebration of their sacrifice.” Acknowledging their understandable and continuous grief, he said, “The pain with the passage of time takes up a different place in your hearts.” General Spears proudly made reference to the determination of the Grenadian people to rebuild and flourish, thereby fulfilling the hopes and honoring the lives of those lost. Ambassador Mary Ourisman pointed out that the remarkable expansion of St. George’s University was similarly a “physical expression of the faith and love which has strengthened the Island and its people.” It is a true testament to the hard work, constant vigilance and ultimate sacrifice required for a democracy. The Honorable Tillman Thomas, Prime Minister of Grenada, recognized the collective responsibility of the community in upholding and building upon the beliefs and principles of a democratic institution, and are critical to a life of peace and harmony. The Governor General, His Excellency Sir Daniel Williams, laid a wreath at the monument as a moment of silence was observed for the fallen heroes. Family members of seven of the soldiers were present: sister of Kenneth Butcher, Daughter of Kenneth Lucas, sister-in-law of Michael Ritz, mother to Jeffrey Scharver, brothers to Stephen Slater, Mark Rademacher and Mark Yamane. Each delivered brief but emotional tributes to their loved ones, providing some insight into the lives that were tragically cut short. A reception at The Caribbean House followed the service. In an effort to address the needs of SGU’s increasingly diverse student body (this year’s incoming School of Medicine class alone originated from a record 29 countries) and their often anxious families, SGU faculty and staff initiated the Beyond Spice : Inaugural Parents’ Weekend.The purpose of Beyond Spice was twofold: designed to further enhance the students’ initial experience at the True Blue campus and solidify a comfort level for their families. From Friday, August 22nd to Sunday, August 24th, 155 family members of incoming classes in the Schools of Medicine, Veterinary Medicine and Arts and Sciences participated in a weekend of informative and culturally entertaining events. For two days, families, friends and loved ones of the students were welcomed by SGU with tours of the campus and its beautiful surroundings, presentations by both faculty and students including question and answer sessions, a lunch barbecue on Black Sand Beach and a late afternoon boat cruise. According to Mr. Colin Dowe, the event moderator and Assistant Dean of Enrolment Planning for Admission, “Separation anxiety is more on the part of the parents than on the students.” With that in mind, a series of presentations appropriately titled “Caring from Near and Afar” were delivered at the University’s Bourne Lecture Hall by several departments including Housing, Department of Educational Services, Student Government Association (SGA) and Counseling. Each session afforded families the opportunity to share their lingering concerns, make comments and recommendations and ask questions. In a Parents Q and A Session, Chancellor Charles R. Modica and other members of the administration fielded questions about the various political issues in medical and veterinary education, and discussed the future growth of the University. Many parents asked well-prepared questions. A presentation by the Student Government Association (SGA) President, Jesse Livingston, served to alleviate concerns of those parents who expressed that many of the students are still very young, and for some this is their first time away from home. Jesse assured the parents that students fully adjust within the first semester on campus, and that many departments within SGU are on-hand in various capacities to assist in their transition. The weekend’s success was not just a tribute to St. George’s University but to Grenada and its people as well. On Saturday afternoon, after attending the Inaugural Nursing Program Commencement on campus, Grenada’s new Prime Minister, the Hon. Tillman Thomas, came unexpectedly upon five tour buses filled with excited SGU families setting off on an island excursion. His face showed deep appreciation at Grenada’s opportunity to welcome and share the Island with the University’s extended family. The Beyond Spice Parents’ Weekend demonstrates the University’s commitment to the students, their families and generations to come. We hope to learn from our inaugural event and make this weekend even more rewarding in terms to come. On Monday, June 23rd, Taylor Hall opened its doors to a unique three-fold conference. For five consecutive days, the critical environmental issues of the Caribbean, including climate change, water and sanitation, were addressed. The 4th Biennial Caribbean Environmental Forum (CEF) and Exhibition, 14th Annual Wider Caribbean Waste Management Conference and the First Caribbean Sustainable Energy Forum provided essential information and solutions to a regional and international audience which included a cross-section of influential representatives from the government sector. Distinguished guest speakers representing the Austrian and German governments shared their expertise with regard to the Conference’s theme: Climate Change, Water and Sanitation: A Shared Responsibility. His Excellency Ambassador Dr. Ernest Martens of Germany, pointed out that Germany is a key player in the movement towards sustainable development and alternative energy sources such as wind, hydro-electric power and bio-energy. In fact, 10% of Germany’s electricity and 5% of their energy are from these alternative sources. Her Excellency Ambassador Magister Marianne Feldmann, Austrian Embassy for Venezuela and the Caribbean, Venezuela, disclosed that Austria also is one of the world’s leaders in hydroelectric power. Ninety percent of their electricity comes from hydroelectric power and as such, they have much to offer the region (Caribbean) both in terms of technical and financial support as the region actively seeks to harness their natural resources for renewable energy. In delivering the keynote address, Dr. the Rt. Honorable Keith Mitchell, Prime Minister of Grenada, highlighting collective responsibility that Grenadians and indeed all peoples of the region must share, said, “We cannot be mere passengers to solutions.” He notes that it is important to take stock of what is happening with our supply of food, water and energy; that harnessing the sun’s energy needs to be more actively pursued as a viable option and as an alternative source of energy; and that waste as a potential resource needs to be more closely examined. This point was further emphasized by the United Nations Environment Program (UNEP) representative, who noted that the most serious cause of marine pollution is still that of untreated waste water. The sad reality is 85% of waste water continues to enter our oceans untreated. Distinguished members of the audience included: Sen. Elizabeth Thompson of Barbados, Ambassador Angus Friday and representatives from Costa Rica, Ecuador, Chile, the Caribbean, Canada, the United States, Austria and Germany — a truly international cross section. Chair of the Grenada National Solid Waste Management Authority Ms. Aine Brathwaite, who worked assiduously to ensure that Grenada hosted the conference, thanked all for the level of interest that the conference drew. She emphasized that in the matter of waste management, “imperative need for action has never been more urgent” and the “need to sensitize our people of what is at stake.” She points to public awareness, education and the implementation of laws as positive steps in the right direction. Dr. Denis Paul, Vice Provost for Institutional Advancement on behalf of Chancellor Charles Modica, and Dr. Allen Pensick, Provost; welcomed the conference participants, stating that “SGU is proud to be a collaborator.” He encouraged them to take some time off from their packed schedule to enjoy the ambience of the campus and wished all a successful conference. Topics addressed at the conference included: Integrated Water Resources Management in a Changing Climate, New Challenges and Approaches to Human Health and Sanitation, Waste Management, including Solid, Liquid and Hazardous wastes, Bio-medical and Technological Waste, and Energy Management including Renewable Energy. It was clear that at the end of the conference there was much food for thought and the challenge now lies in maximizing the information gleaned to the benefit of the countries of the respective participants. It seemed appropriate that this year’s CEF-4 Conference be the inaugural conference held at St. George’s Taylor Hall. The Late Vice Chancellor Emeritus, Keith Breden Taylor, DM, FRCP (1924-2006), for whom the facility is named, worked tirelessly to implement his vision that St. George’s University should grow into an international university. 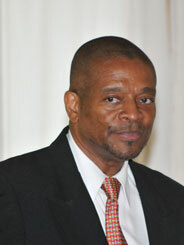 He achieved that by creating a Panel on Research and Scholarly Activity in 1992; founding a research institute in the Windward Islands Research and Education Foundation (WINDREF) in 1994 which allowed the development of a graduate studies program; and by instituting the School of Arts and Sciences in 1996 which broadened the academic opportunities for students in the region. The international scope of the Environmental Conference is consistent with his hope and plan for SGU. In addition to providing the venue, as a major co-sponsor St. George’s University also provided logistical support, accommodations, transportation and technical support. 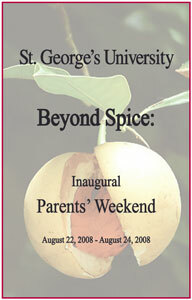 St. George’s University will be conducting its inaugural Parents’ Weekend from August 22, 2008 through August 24, 2008. 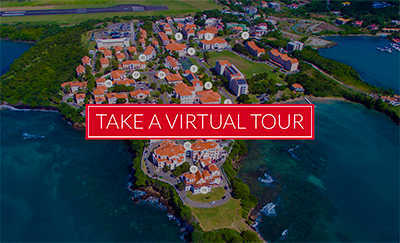 The “Beyond Spice” Parents’ Weekend (Grenada is also known as the “Spice of the Caribbean”) will allow parents and families to experience the full educational program, with its emphasis on student services and commitment to student well-being, as they enjoy the elegant beauty of its breathtaking campus and surroundings. SGU’s Robert Ryan, Associate Dean of Enrolment Planning and member of the “Beyond Spice” Parents’ Weekend Committee, explained that selecting the date for the event was the first step toward maximizing its effectiveness for both parents and students. “Inviting the parents of our medical and veterinary medical students to Grenada the weekend after classes start has several benefits,” said Dean Ryan. “We (the committee) believe that having parents join their children a week after classes begin will give the students an opportunity to assess and request any additional items needed to make their stay in Grenada most productive and comfortable. In addition, the campus and its students will have settled nicely into a routine, allowing parents to experience SGU’s impressive facilities in a less frenzied environment.” Dean Ryan also mentioned the resulting benefit of opening up a minimum of 300 coveted airline seats on an already limited flight schedule to Grenada. 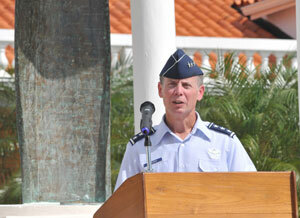 Dean Ryan explained that more and more parents were arriving with their students in Grenada at the beginning of term. “The University is thrilled to see this level of care on the part of families, and we have become extremely frustrated that we are unable to marshal the necessary University resources to pay full attention to them since we are settling in the students who have just arrived.” The University is committed to focusing on the parents’ needs and has dedicated a full weekend to do so. The “Beyond Spice” Parents’ Weekend will include tours of the campus and its state-of-the-art facilities including labs, library, lecture halls and dorm rooms. The faculty and staff of the University recognize the importance of familiarizing both the parents and their children with not just the University’s True Blue campus, but the Island and its people. Therefore, tours have been arranged so visitors can experience the Island’s pristine surroundings. A Question and Answer Session with the top administration as well as informative presentations from the Department of Educational Services, Professors, Counselors, Student Government Association, Housing and Clinical have been carefully planned to assure parents that in addition to providing an internationally recognized academic program, their children’s well being is the University’s utmost priority. Several exciting cultural events are also included in the festivities. The weekend’s activities will close with the School of Medicine’s White Coat Ceremony to be held at 4:00 pm on Sunday afternoon. After inspirational speakers, students take an Oath to the Profession of Medicine. A reception for students and families will follow. The School of Veterinary Medicine White Coat Ceremony will be held the Tuesday prior, and all SVM parents are invited to come early to attend the event and stay to enjoy the weekend festivities. St. George’s University has planned a similar event in the United Kingdom with our Northumbria University (NU) partner, welcoming parents of the Keith B. Taylor Global Scholars Program students during the weekend of August 15th. Due to a smaller class size of approximately 150 students, SGU and NU are confident that holding Parents’ Weekend during the start of classes will not interfere with its similarly scheduled events. The University looks forward to Parents’ Weekend becoming a new tradition on both the True Blue campus as well as its Northumbria University campus. If you are interested in attending, please contact us at ParentsWeekend@sgu.edu. It was an exciting week at True Blue, one that celebrated the cross-cultural impact of Caribbean women’s literature throughout the 21st century. From May 19 through May 23, St. George’s University hosted the 11th Conference of the Association of Caribbean Women Writers and Scholars (ACWWS). The conference theme was Traditions and Legacies, Revisions and Interventions: Caribbean Women Writings in the 21st Century. With over 70 presenters, which included Grenadian poet and novelist, keynote speaker Dr. Merle Collins, the Conference provided an opportunity for participants to immerse themselves in Caribbean folk culture, oral histories, and creative and critical writing celebrating the artistry of women writers across the Caribbean, South America, Central America, North America and Europe. On Tuesday, May 20, Dr. Merle Collins’ presentation took the form of a public lecture at Bell Lecture Hall. Dr. Collins, a prolific writer and Professor of English and Caribbean Literature at the University of Maryland spoke about “Caribbean Women Writing in the 21st Century: Visions to Recover, Creations to Re-Create.” The feature address traced the unwritten histories of Grenadian and Caribbean women whose acts of rebellion shaped the future of the Caribbean. Their interventions provide writers and scholars with the fertile ground on which to cultivate a Caribbean literary tradition. Another conference highlight was its plenary sessions, which were well attended by high school students and by students of the community college. The first plenary of Caribbean women writers focused on Caribbean writers and the factors that shape their writing and publishing lives, while the plenary on scholars explored the ways in which Caribbean writers are manipulating form and genre in the articulation of the thematics of community. On Thursday, May 22 various authors including Dr. Dessima Williams of Brandeis University and Dr. Merle Collins presented on “Remembering the Grenada Revolution” from 11:15 am to 1:00 pm. Topics included “The Storm That Never Ended: How the Grenada Revolution Stays Alive,” “The Legacy of the Grenada Revolution in Literature,” “Hurricane Histories: Landscapes and Languages of Revolutionary Memory,” and “Say It In Performance: The Story That is Still Difficult to Speak.” This session was followed by a presentation of Dr. Collins’ video documentary entitled “Caribbean Nation: Saraka and Nation in Grenada and Carriacou” from 1:00 pm to 2:30 pm. Oonya Kempadoo and members of the Writers’ Association of Grenada (WAG). Oonya Kempadoo is a writer who was born in Sussex, England, in 1966 of Guyanese parents. She was brought up in Guyana and has since lived in Europe and various islands in the Caribbean, and now resides in Grenada. 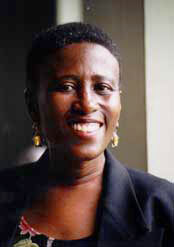 Her first novel, Buxton Spice, was published to great acclaim in 1998, and was nominated for the 2000 International IMPAC Dublin Literary Award. She was named a Great Talent for the Twenty-First Century by the Orange Prize judges and is a winner of the Casa de las Américas Prize. The general public was invited to attend the public lecture and presentations to engage with the producers of Caribbean Literature. Monday, April 7th marks the beginning of the 2008 National Public Health Week (NPHW) which this year focuses on Climate Change: Our Health in the Balance. April 7th this year was also World Health Day which honors the establishment of the World Health Organization’s (WHO) Constitution on April 7, 1948. The University lauds Grenada’s efforts to raise awareness of individual responsibility in a global world. In an effort to raise awareness of the numerous hazards which range from extreme weather events to changes in the dynamics of infectious diseases, SGU’s Public Health Students Association, the Department of Public Health and Preventive Medicine along with its Associate Professor and Environment Scientist, Dr. Hugh Sealy, have developed a series of week-long events designed to educate and empower both students and community members. Public health organizations and agencies worldwide are observing this week to highlight the adverse effects that climate change has on the health of populations, and SGU is a part of this world wide effort. It is incumbent upon all public health institutions to educate people to the very real consequences of climate change on health, but according to the WHO, the health effects are diverse and global in nature. The World Health Organization states that the health impacts of climate change will be difficult to reverse in a few years or decades. However, if we make certain environmental, behavioral and policy changes, many of these possible impacts can be avoided or controlled. Additionally, many of the steps needed to prevent climate change will have overall positive health benefits. St. George’s University is eager to communicate the connection between the way we lead our lives, our impact on the planet and the planet’s impact on our health. Wednesday, April 9, at 8:00 PM –You Decide Program Television Program featuring Dr. Hugh Sealy (Community Channel 6 – Live broadcast). Dr. Sealy is an Associate Professor in the Department of Public Health and Preventive Medicine & a Member of the Executive Board of the Clean Development Mechanism under the United Nations Framework Convention on Climate Change. Thursday, April 10 – Campus Poster and Slogan Campaign (led by PHSA, public health students will erect slogans and poster related to the theme around campus. Friday, April 11 – Visit to the Anglican High School by the PHSA and other public health students to engage them in an Interactive health education session on the impact of climate change on health. Funds from the movie and the party will be donated to charity for the prevention of malaria. The third season of the SGU Knowledge Bowl began on Tuesday, February 19th with a match between Presentation Brothers’ College, last year’s 2nd place team, and St. Joseph’s Convent, Grenville. After a head-to-head competition in the first two rounds, Presentation Brothers’ took the lead in the General Knowledge round and won by four points, with a total score of 26. The SGU Knowledge Bowl is widely recognized as the premier academic quiz competition in Grenada. The event is collaboration between St. George’s University, Grenada Cablevision – Community Channel 6 and the Ministry of Education, and was designed to encourage and facilitate a healthy academic exchange between 19 of Grenada’s 22 secondary schools. The academic competition features teams of third, fourth and fifth form students. The material for the quiz questions came from the Caribbean Secondary Examinations Council (CSEC) syllabi in the areas of science, information technology, the arts and humanities. Students’ awareness of geography, local food and culture, sports, and current affairs will also be tested in a third round buzzer competition on General Knowledge. This year’s competition will also challenge the viewing audience to participate, testing their knowledge as they too compete for prizes. As with last year’s competition, the team emerging victorious as SGU Knowledge Bowl Champion will take away a challenge trophy and $10,000 in prize money, while the 2nd place team will be awarded $5,000 in prize money. Individual team members and coaches of the teams in the finals will also receive special prizes. Cable & Wireless Grenada Ltd. and the Grenada Cooperative Bank Ltd. (Coop) are major sponsors of the event for the third consecutive year. The companies will again fund the broadcast of the quiz and individual prizes for participating students. The Grenada Postal Corporation will provide refreshments. Glenelg Spring Water and Geo. F. Huggins have also recommitted their support for the third time, providing drinks for participants. The five corporate sponsors have a history of initiating community development projects and CC6 and SGU are honored to partner with them on this venture for a third year. The competition is aired on CC6 on Tuesdays and Thursdays at 8:00 p.m. with repeats on Wednesdays and Fridays at 11:00 a.m. and Saturdays at 7:30 p.m. The SGU Knowledge Bowl finals will be held on Saturday, April 19th. On October 1, 2007, the much-anticipated University radio station electrified the airwaves of St. George’s University and the neighboring Grenadian communities. While SGU 107.5 FM is in its fledgling stages, its inaugural air date made an important connection between the community and the University. As the University continues to expand, radio is an appropriate and dynamic vehicle for communicating SGU’s educational mission. 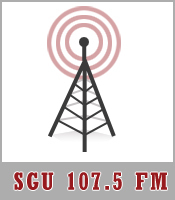 SGU 107.5 FM is a non-commercial radio station run by the Office of University Communications (OUC). Broadcasting from the True Blue campus to a relay station at Grand Etang, the signal reaches approximately half of the Island. The station is committed to balanced, non-partisan, non-denominational, community-oriented programs designed to educate, entertain and attract the widest possible audience as it serves the interests of SGU’s internal and external communities. According to Terry Williams (T.W. ), a seasoned radio personality and the station’s talented technical operator, “SGU 107.5 FM is not just a radio station, it is an education.” T.W. has worked with Grenada Broadcasting Network (GBN) and other radio stations across the Island and has been involved in SGU 107.5 FM from its inception. With new equipment, an actual studio and its broadcasting license, SGU 107.5 FM is well on its way to achieving its goal. In an effort to serve the community at large, the radio station will be linked closely with the University’s disaster preparedness and response initiatives, providing critical and accurate information in the event of an emergency. Over the next year, the station will also work closely with the various Schools of the University to provide an interesting and interactive medium of communication between SGU and the public. SGU 107.5 FM programming will expand to include interactive shows, community service announcements and talk time. New announcers and personalities are expected to join the broadcast team by next semester.